* First we discussed why films have soundtracks. We watched a really exciting clip from 'Ratatouille' without the sound. However, the children found it boring and were desperate to watch it again with the audio! As well as not being able to hear the speech, they couldn't hear any sound effects / background music which usually helps to increase the viewer's engagement with the film. We also watched a number of old silent films starring Charlie Chaplin (found on Youtube). It was interesting seeing the children's reaction to these films… the lack of speech meant that they had to watch the action very closely to follow the storyline. * Then, we listened to a number of film soundtracks and the children tried to work out the theme / story of the movie based upon what the music was telling them. I've tried this activity before and it's always interesting to hear the ideas that the children come up with. This game was relatively new at the time, and it really made the children think about how much time and effort is spent making the music for film, TV and games. * I'd also found two short animated films. 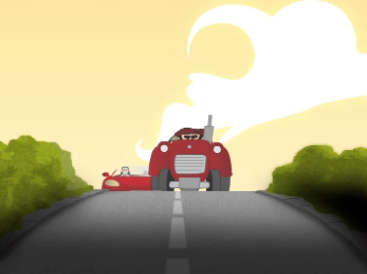 The first is called 'Gone in 60 Hours' and is about a driver who is in a hurry and gets stuck behind a tractor. It's great fun to watch, but it doesn't really have a musical soundtrack (just the sound effects of vehicles, and part of 'The Archers' theme!). So, we discussed how we might go about composing a soundtrack, identifying how the musical elements might change at particular points (e.g. louder / softer dynamics, faster / slower tempo etc.) as well as the instruments that might be appropriate choices. 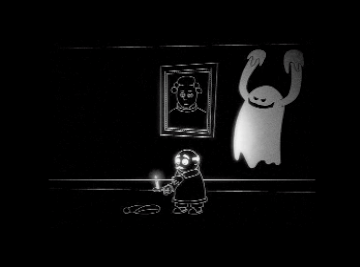 * During the next lesson, we watched the second short film, Ghost Story. This does have a soundtrack, but I muted the audio so that the children couldn't hear it. Again, we talked about the type of music that might be appropriate for the film. Then, the children had a chance to compose their own. I imported the film into Garageband and deleted the audio track and saved this as a template file. We only had access to four Apple computers, so the children worked in pairs (with headphones and audio splitters so they could both hear their work). * The children had already had some experience with Garageband, so they coped extremely well with the task, using the built in loops to create a soundtrack. 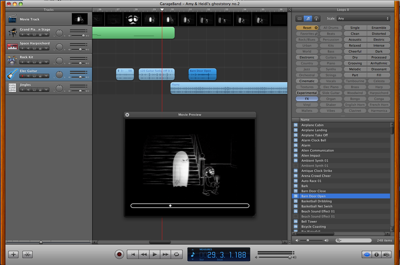 Garageband allows you to scrub back and forth through the film, so it was very easy to match particular sounds / loops with different parts of the movie. * I was highly impressed with their completed soundtracks. Some children had 'zoomed in' to the timelines, placing sound effects at specific locations in order to build up suspense and frighten the viewer when the ghost pops up! Their choice of music loops was also particularly effective, and there was a lot of discussion going on throughout the creation of the music about the choices being made. This final activity, in particular, is something that I really would like to try again. Technology today makes this kind of activity incredibly easy and accessible to all. The children really enjoyed the challenge, which was an extremely valuable learning opportunity, covering a number of skills and concepts. Hey do you have a link to the ghost story movie clip that you used? do you have the link for gone in 60 hours? How can I download this video and import it into garageband? I have taught movie soundtracks for many years and I follow a similar process. I am going to take your advice on a few things and I think it will be a better experience for my kids. Thank you so much! I teach 6-8th grade and I download movie trailers from youtube and have the kids rewrite the music to popular movies. It works really well and they are quite engaged when composing a soundtrack to "Pirates of the Carribean" or "Tangled" etc. Did you mute the Charlie Chaplin soundtrack? I used this site to add download to my youtube options: https://addons.mozilla.org/en-... It works great! I have been doing this task with my grade 8 students. Instead of using loops, they make their own melodies using the on screen keyboard. At first, students were not happy that I don't allow loops which meant more work for them. In the end they were all happy and proud that they composed their own music. Use your school environment as a stimulus for composition.